As the title suggests, these are a compact button with both the microswitch and LED built into them. This makes them perfect for use where depth below the control panel is an issue and also makes for easier installation. 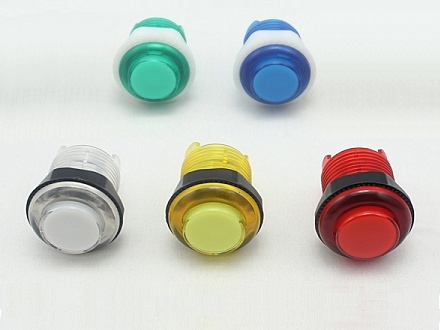 These buttons have a “non-clicking” microswitch built in making them quiet, smooth and accurate in their action. They also have 2 LEDs built in which illuminate the entire button very evenly, so there is no “hot spot” like on some buttons you see. Best of all these buttons will fit into a standard 28mm hole in a panel up to 20mm thick, so they make for a good replacement button in existing machines.